Clare Florist - Press Releases. Clare Florist is proud to support Maggie’s Cancer Caring Centres this October throughout Breast Cancer Awareness Month with the creation of the Maggie’s Pink Bouquet. Continuing their support for Maggie’s Cancer Caring Centres, Clare Florist has created the beautiful Maggie’s Pink Bouquet packed with fresh pink roses, germinis, hypericum and foliage which are arranged by one of their experienced florists. For the duration of Breast Cancer Awareness Month each of the Maggie’s Pink Bouquets sold will see Clare Florist donate £3.50 to Maggie’s Cancer Caring Centres. Maggie’s Cancer Caring Centres empower people to live with, through and beyond cancer. Bringing together professional help and communities of support, Maggie’s supported over 89,000 people affected by cancer across the UK last year. The Maggie’s Pink Bouquet costs £34.99 including next-day delivery and can be delivered throughout the UK seven days a week. ClaresFlorist is a family owned business with over 30 years experience focused on top quality floral products and services for its customers. Clare Florist, one of the UK's leading online flower delivery retailers has this week unveiled its bright new updated website for the Autumn. The launch of the new site also coincides with the start of Clare Florist’s stunning Autumn flower collection. The newly updated site offers consumers significant changes and benefits over the previous website along with a vastly expanded product range covering flowers, bouquets and gift sets for every occasion. Clare Florist started back in 1978 with the opening of their first family run Clare Florist shop. Now more than 3 decades later, the company has become one of the acknowledged and respected leaders in floral design and distribution throughout the country. In 1995 Clare Florist took advantage of the new computer technology available and as an extension of the retail shops designed one of the first florist web sites in the UK. Clare Florist today provides over 30 years of retail floristry experience, of which 14 years have been online. The company firmly believe that a customer’s online shopping experience should be both easy and enjoyable. The new-look website has been designed to offer just that – a site that's easy to navigate and packed with beautiful floral products and gift ideas for any occasion. Searching for exactly what you are looking for could not be easier. In addition, the new site has been given a fresher, crisper look giving the user/customer a more pleasurable experience. Fanatical about service Clare Florist have made customer contact incredibly simple by improving the live chat system and utilising the latest in social media such as Twitter and Facebook. The service gives customers all the relevant flower information when and where they want it. There is now even a You Tube channel where customers can view videos of products, as well as see some of the fun things that happen each day at the Clare Florist HQ! Clare Florist launches a Fairtrade Rose bouquet for delivery next day throughout the UK. The Fairtrade mark ensures that the providing flower farms meet the basic labour and environmental standards, eliminating forced and child labour as well as ensuring workers are given fair wages, working conditions- that comply with health and safety standards, while promoting freedom of association and collective bargaining. This week Clare Florist is proud to launch its first Fairtrade product - Fairtrade Roses, which are certified by the Fairtrade Foundation. This lovely bouquet can be ordered for delivery throughout the UK seven days a week. Next working day delivery is even included in the price! The Fairtrade mark ensures that the providing flower farms meet the basic labour and environmental standards, eliminating forced and child labour as well as ensuring workers are given fair wages, working conditions that comply with health and safety standards, while promoting freedom of association and collective bargaining. Fairtrade certified farms are also committed to resolve housing issues and encourage workers to join trade unions such that they are better represented. The new Fairtrade Roses not only promise a better deal for the growers working on flower farms in Kenya, but will also enable customers to improve the quality of the lives of workers by supporting community, environmental and economic development projects through the Fairtrade premium that is included as part of the Fairtrade pricing scheme. The sales of Fairtrade roses have already led to a range of implemented projects including development of education facilities, purchase of equipment and furniture as well as drilling holes for water supplies in local villages. Clare Florist are keen to support Fairtrade and ensure that the quality of lives on the flower farms be continually improved, whilst acknowledging our customers' demand for buying flowers ethically and enabling customers to help the developing world gain a better future through Fairtrade Rose purchases. As online flower sales blossom, and on the occasion of their ninth web anniversary, Clare Florist has introduced two fresh new items to their web site. 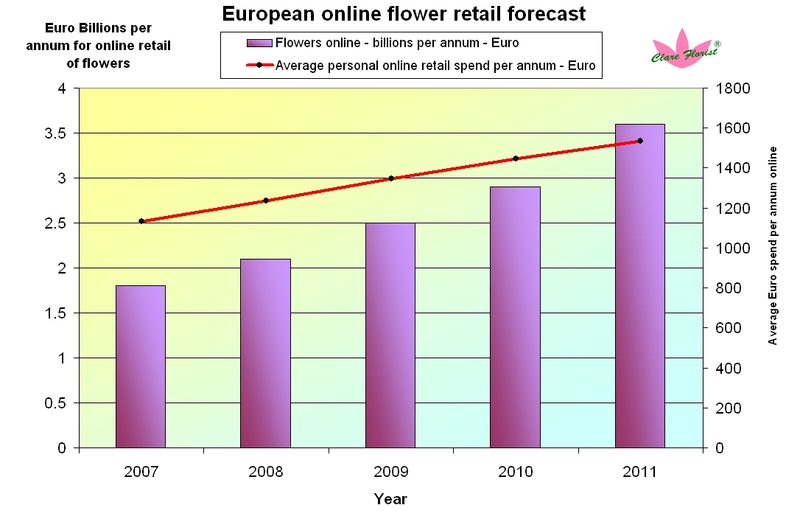 Online sales of flowers within Europe are forecast to grow by over 20% per annum over the next 4 years. 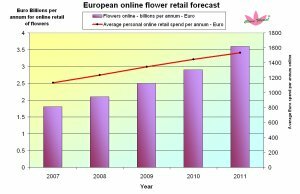 The total annual European online retail market value for flowers is about 1.8 billion Euros (£1.3 billion) in 2007 and is forecast to grow to 3.6 billion Euros in 2011 (£2.6 billion). Annual average spend for all items purchased online is also forecast to increase from 1132 to 1536 Euros over the same period. (£800, £1090 respectively). 1. To celebrate 9 years of online flower sales (Amongst the very first florists in the UK to have an online presence with a website in 1998) Clare Florist have launched "Colour Collections" range of flowers for delivery throughout the UK. This range of flowers has been designed by our expert florists specifically to make buying flowers an extremely pleasant, quick and easy process for everyone ordering online. The additional advantage of this range is that they also provide the customer with a larger than normal bouquet - all for only £34.99 inclusive of UK delivery. How do we do this? Simple -- the customer selects the colour of flowers they want and then we hand select more of the best seasonal flowers and deliver them next day throughout the UK without any fuss. Clare Florist supplying lovely flowers throughout the UK without any fuss via the internet and freephone number 0800 073 7676. Originally formed in 1978, Clare Florist has grown steadily to become one of the leading online flower retailers within the UK. This growth has been built on a reliable, comprehensive and easy to use website along with a secure and effective online ordering process. All major types of credit and debit cards are accepted. All the flowers purchased by Clare Florist come directly from (usually) the Dutch markets and, along with the excellent packaging used, freshness is maintained to the final customer. Forecast data based on a Forrester Research report dated 29th June 2006.